Scores have been duped by a fake video of an alleged "Filipina wife being maltreated by her foreigner husband" that's circulating online. 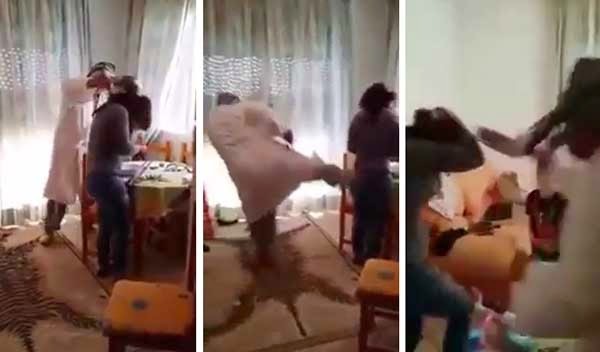 In the video, a supposed female overseas Filipino worker is seen being hit by her husband with an aluminum kitchen ware and was also kicked from behind. The uploader posted that the OFW is from Surigao del Sur who got scolded by her male partner after failing to cook food for the family's lunch on time. "Pinay from Surigao del Sur, minamaltrato ng kanyang napangasawang foreigner dahil hindi kaagad nakapagluto ng kanilang Tanghalian," Facebook user Mabuhay Winfrey relayed. "Ganito daw palagi ang asawa niya kapag nagkakamali siya kahit maliit na bagay binubugbog na siya." According to Winfrey, the woman wanted to come home to the Philippines but has no money to pay for the airfare. She is also afraid to report her sorry plight to police for fear that she might get ignored or rejected. "Gusto na niyang bumalik ng Pilipinas pero wala siyang pera pamasahe nila ng kanyang anak," the uploader said. "Takot din siya magsumbong sa mga pulis dahil hindi rin daw siya kakampihan at paniniwalaan." The person who took the video is the husband of the woman's friend, said Winfrey, who urged everyone to share the story until it reaches the authorities. The viral video already garnered more than 13,000 likes and over 103,000 shares on Facebook as of this posting. As a normal reaction, Filipino netizens who saw it bashed the foreigner for "hurting" his Filipina wife over small mistakes. It turned out that the viral video is fake based on another video that was taken from a different angle. It has been said that the unidentified persons involved are not from the Middle East but from Romania. Are you among those who were duped?